Under clear skies, a Bell 412 EP helicopter left Malta International Airport yesterday for a 10-minute flight marking the resumption of the Malta-Gozo air link. At the controls of the helicopter, ferrying 13 passengers, were chief pilot Luis Navarrate and captain Salvador Garrazoni. Although the service took off under the low profile of a seemingly small operation, the Spanish company running the service, Helicopteros Del Sureste SA, is already aiming to tap other destinations including Sicily and Libya. The helicopter is equipped with a port enabling each passenger to carry 20 kilos of luggage, as on an aeroplane. The operation is bound to have business people breathing a sigh of relief, as it will ensure they make the Malta-Gozo crossing in the shortest time possible and in a state-of-the-art aircraft. That's to say nothing of the hoteliers and people engaged in ancillary tourism services who have missed the air link, unavailable since October. Although the inaugural flight lasted only 10 minutes, the flight time on the company's timetable shows that the trip normally takes 15 minutes. Between now and October 29, the company will operate 18 flights a day, going down to eight in the winter months. Currently, the first flight from Gozo takes off at 5.45 a.m. and the last one departing Malta at 1.30 a.m. Speaking to reporters at the Gozo heliport, operations director Antonio Martinez Garcia said the helicopter can fly in almost any kind of weather. Thick fog would be one of the conditions making it difficult to fly, which is why the aircraft is based in Gozo where fog is not as likely to form as in Malta. Fielding questions from reporters, Mr Martinez Garcia said the company will break even once it ferries 40,000 passengers. He said that one could not compare the tariff - Lm50 for a two-way ticket for non-residents and Lm26 two way for residents - with any other service, least of all low-cost airlines. "If one were to make use of such a service in Monaco, Seattle or Vancouver, the price would be much more expensive," he said. Tour operators would be able to negotiate lower tariffs for groups, he added. Regarding costs, he explained it was just as costly to maintain a helicopter as an airplane because helicopters have more moving parts than a plane. Asked whether this was the first time the company had operated in a relatively small market, Mr Martinez Garcia noted that they do not consider the Malta-Gozo service as a small operation - the company operates a service in Spain that handles 20,000 passengers annually. The company has signed an agreement with the government to operate for the next five years. Mr Martinez Garcia said the service will very much depend on the scale of the demand for it. 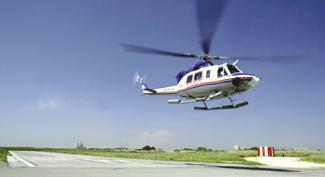 "We can bring over a smaller or a larger helicopter depending on demand. There are various solutions we can go for. Being one of the stakeholders in the tourism industry in Gozo, we plan to stay in Gozo for a long time, which is not a destination for the masses," he said. The company has been making use of Bell helicopters - of which they own 55 - since 1996 and they have been happy with them. The inaugural flight was reserved for reporters and cameramen as well as personnel from the Ministry of Competitiveness and Communications and the Ministry for Gozo including ministers Censu Galea and Giovanna Debono. Ms Debono said the service was characterised by high levels of safety and technical competence. She said the company was prepared to offer reduced prices to clients who use the service when Gozo Channel ships do not operate due to bad weather. On such occasions the helicopter will land and take off from Cirkewwa. Mr Galea aimed a broadside at those business people who, he claimed, had been pushing their own agenda, giving the impression they were against the helicopter service. "The other competitors who bid for this service had asked to be compensated with Lm100,000 a month, something which did not make economic sense to the government," Mr Galea argued.